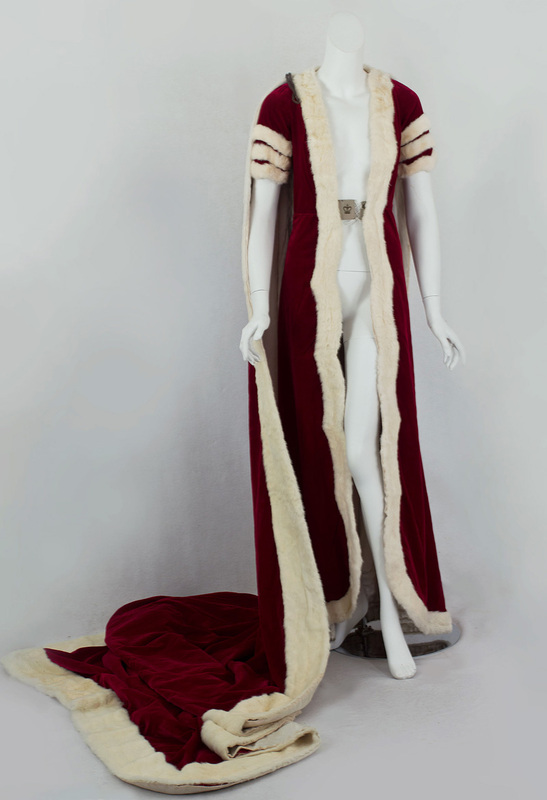 This English coronation robe was an unexpected find on a Philadelphia house call. A ceremonial costume owned by a British noblewoman is not often found in an American attic. Due to sketchy provenance and the unchanging style of a Peeress' robes, dating is difficult. However, ancillary evidence allows us to make an intelligent judgment on the matter. The robe was brought to Philadelphia in the 1940s in a white parchment Louis Vuitton trunk, which also contained pieces of 1920s Paris couture. 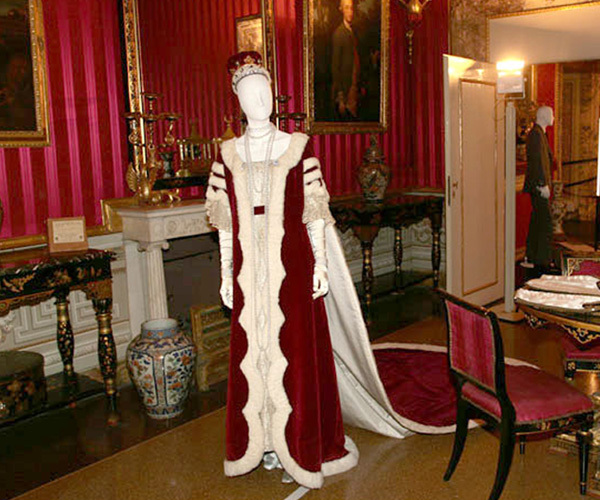 The small size of the robe suggests a young British noblewoman who attended the 1937 coronation of George VI. The seller of the robe in 2007 was in her 90s. In 1937 she would have been about 23 years old. Her sister, who wore the robe to the coronation, would likely have been 20-26 years old at the time. According to verbal provenance from the seller, the original wearer-owner was a French woman who had married into the British nobility. 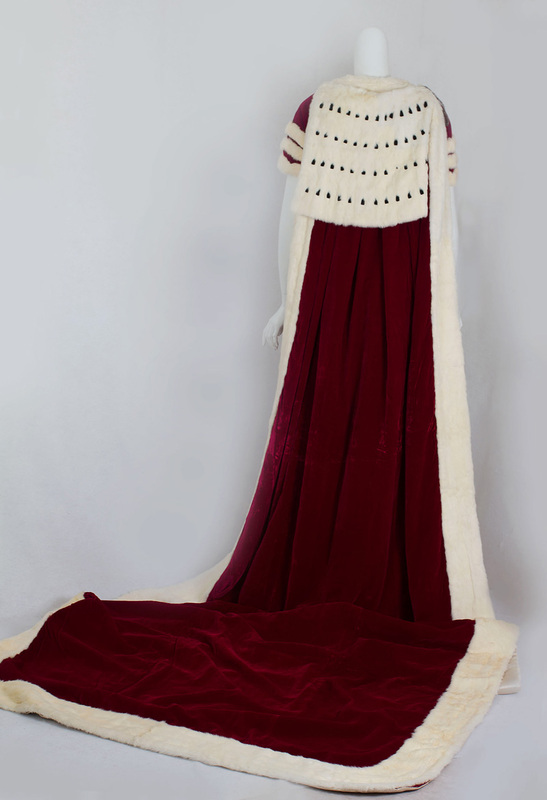 The style of the coronation robe has been unchanged for at least a century; hence, the earlier 1911 dating used, e.g., the coronation of George V. Since the young woman who wore the robe in 1937 married into a noble British family, the robe was likely provided by her husband's family. If only clothing could speak! 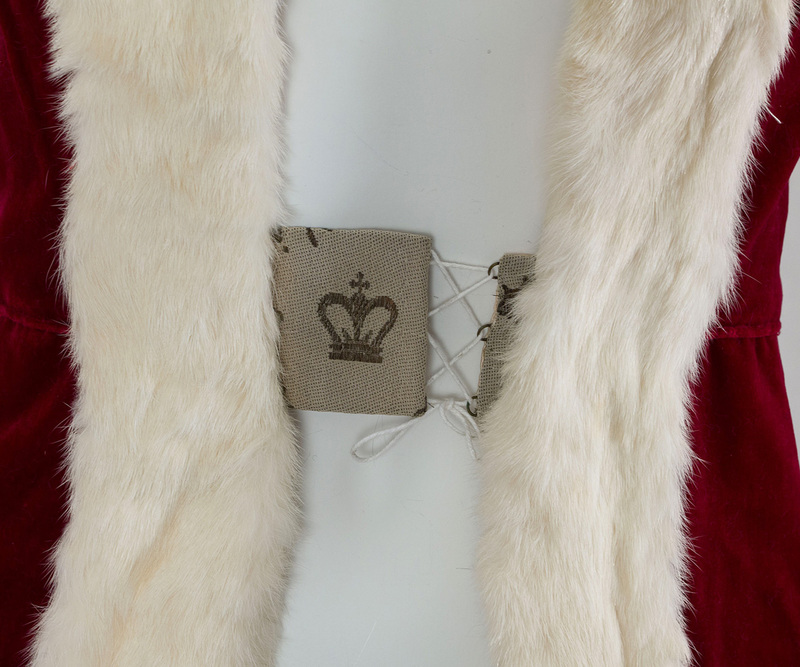 The picture below of the coronation robe worn by the Marchioness of Reading to the 1902 Coronation of King Edward VII shows how the robe would have appeared when properly accessorized. Protocol states that "The dress should be of white or slightly cream colour with lace, embroidery or brocade. Feathers and veils will not be worn, but a tiara should be worn if possible." 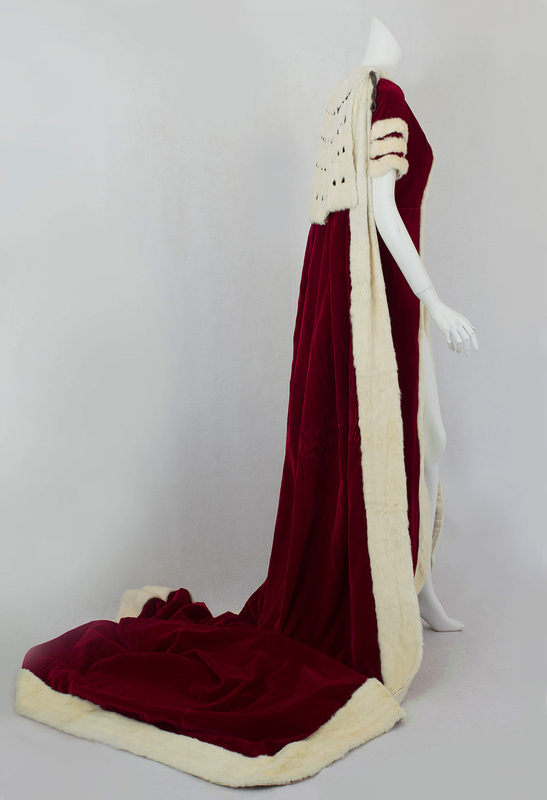 Our coronation robe and train were fashioned from claret velvet. 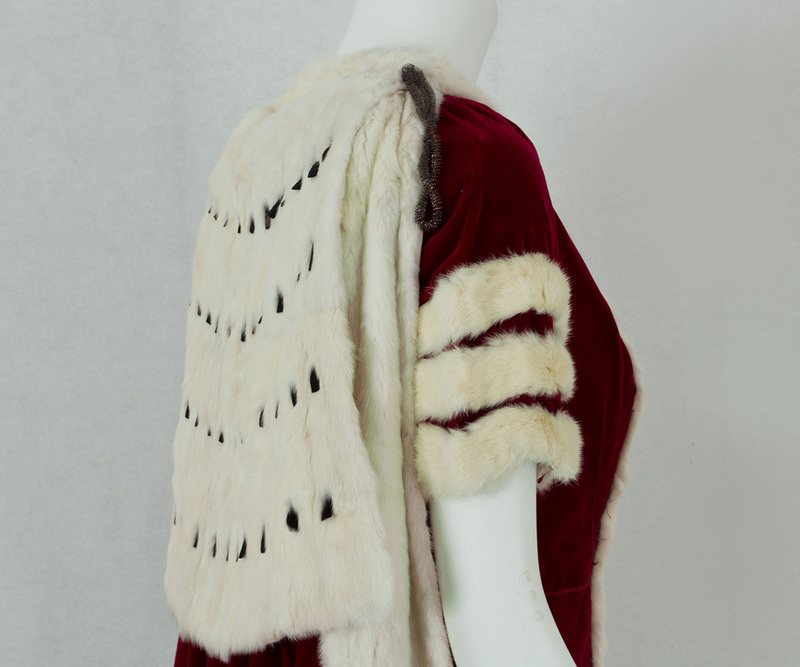 The short capelet is of white ermine with rows of black sealskin spots. The robe and train are lined with ivory satin. The shaped robe closes in front with a hooked petersham. 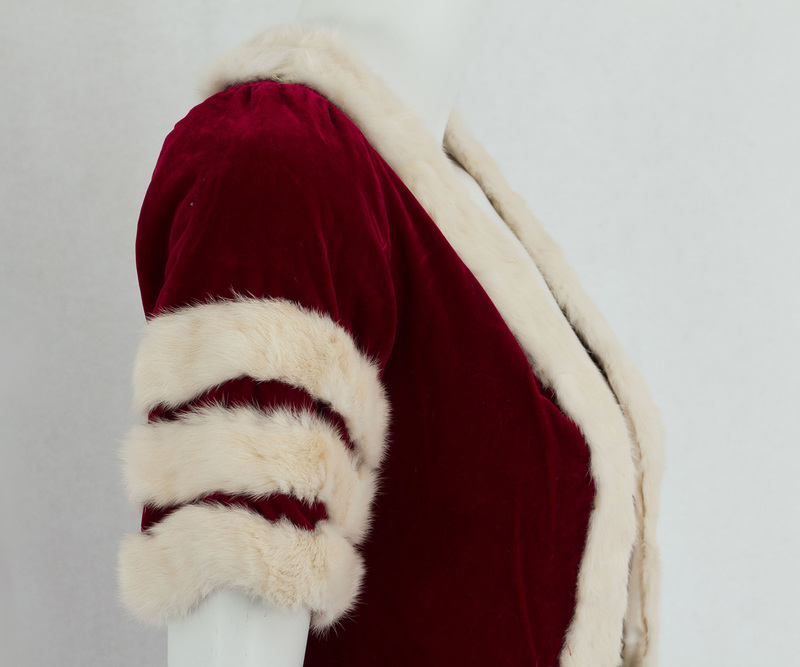 The rich claret velvet is imbued with dignity and tradition! The robe was too small to close on my mannequin. I added the lacing to be able to close the robe for photography. In practice, no lacing would have been used. A separate train attaches to the robe with hooks at the neckline in back. 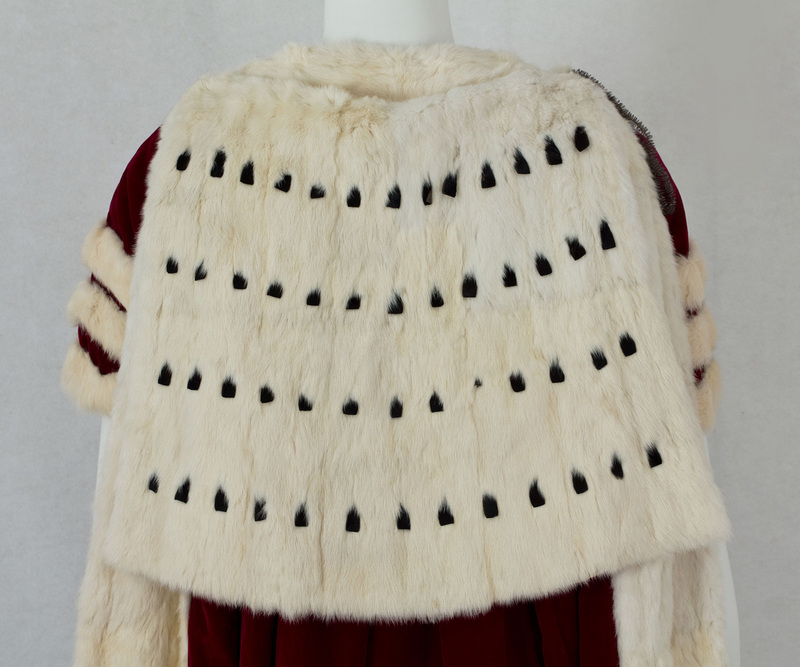 The ermine capelet has four rows of black sealskin spots, indicating the rank of Duchess. The train is over two yards long. The front closure of the robe has an embroidered bronze coronet. A Duke (Duchess) is the highest rank and title in the British peerage, first introduced by Edward III in 1337 when he created his son, the Black Prince, as the first English duke. A Duke is “Most Noble” and is styled “Your Grace”. After the Duke (Duchess) at the top rung of the British Orders of Precedence there follow, in order of rank, Marquess/Marquis and Marchioness; Earl; Viscount; Baron; Baronet. With its peerless quality and condition, this magnificent coronation robe is an amazing value because of its intrinsic beauty as well as its historical importance. The condition is almost excellent. 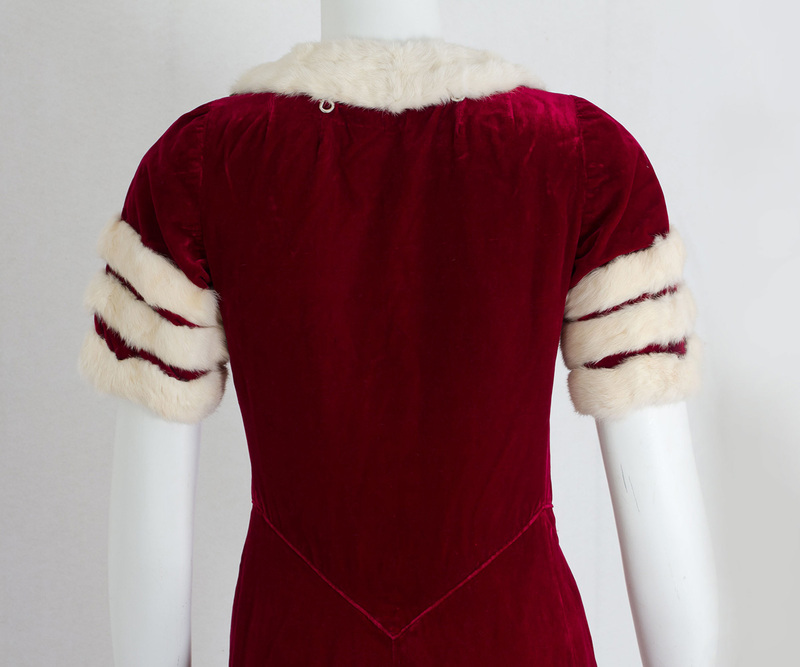 On the back ermine capelet, one black sealskin spot has partially broken off. There is slight soiling on the lining of the train. These are minor flaws for an exceptional historical artifact. It measures: 34" bust, 24" waist, and 59" from shoulder to front hem (longer in back).